Description: This demonstration illustrates the images formed by convex and concave mirrors. Hold up the concave mirror and point it at the class. Note that they are upside down, and very small. Now, with your back facing the class, hold the mirror up near your face and slightly to one side. The students can now see a very lage impage of your face which is upright. Turn from side to side so the whole class can see you. This happens because a concave mirror will simply create an inverted real image when the object is beyond the focal point. When the object is within the focal point, the mirror produces a very lage virtual image that is upright. At the focal point there is no image. Hold up the convex mirror and point it at the class. Note that they are right side up, and each person can see a wider view of the class than with the concave mirror. The students see a slightly smaller image of your face which is right side up. 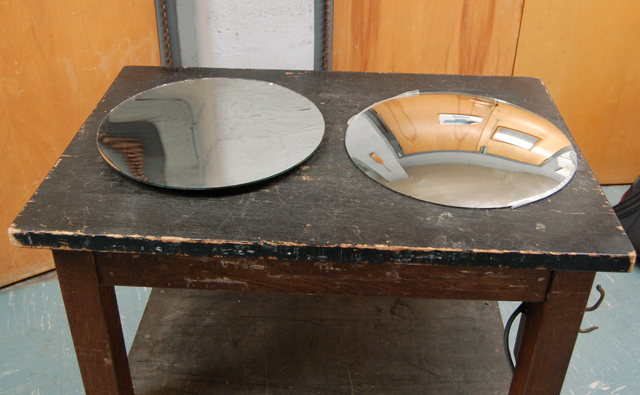 This is because a convex mirror always produces a virtual image no matter where the object is located. Explain, that due to their large field of view, these mirrors are used in stores for security purposes and on driveways and streets where traffic is not visible.